Greensboro, N.C. – Research from the Center for Creative Leadership (CCL®) shows that the vast majority of valuable leader development experiences happen on the job as leaders deal with challenges and adversity. But most organizations focus mainly on the coaching, mentoring, and formal training programs that deliver an important but smaller portion of a leader’s development. How can learning and development professionals put learning on the job at the center of leadership development in their organizations? 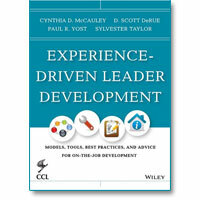 Experience-Driven Leader Development: Models, Tools, Best Practices, and Advice for On-the-Job Developmentprovides practical answers from individuals who are championing experience-centric leader development systems in organizations. The book’s other co-editors are D. Scott DeRue, management professor at the University of Michigan’s Stephen M. Ross School of Business; Paul R. Yost, associate professor of industrial-organizational psychology at Seattle Pacific University; and Sylvester Taylor, a director in CCL’s research, innovation and product development group. The 575-page book, published in November by Wiley, includes dozens of contributions focused on such critical topics as creating developmental experiences for high potentials, building feedback and reflection into job assignments, embedding experience-driven development into human resource systems, and shaping organization cultures that support on-the-job learning. Learning and development leaders from many of the world’s most influential organizations explore practical ways to create effective on-the-job leadership development initiatives. Among the organizations represented: Accenture, Experian, GE, IBM, McKinsey & Co., Roche, Royal Bank of Canada, Teach for America, U.S. Army, and Wesfarmers.